It’s that time of year again! The 4th Annual Lighthouse Wine Label Contest is in a go mode, and you’re invited to participate! 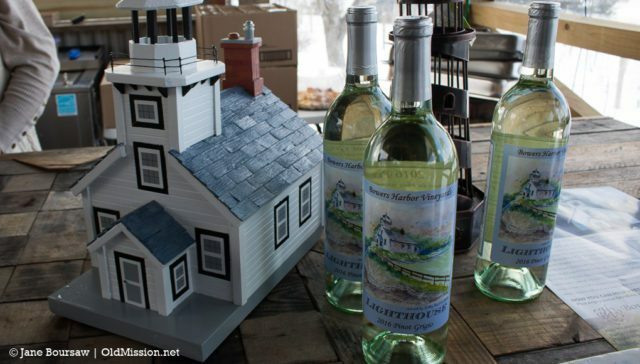 The Mission Point Lighthouse Friends, in conjunction with Bowers Harbor Vineyards, is sponsoring their annual contest and inviting folks to submit their wine label art for a special Bowers Harbor Vineyards Pinot Grigio. The winner will not only have their art featured on the bottles, but will also receive a cash award of $250. Artwork must be original and representative of Mission Point Lighthouse located on the Old Mission Peninsula. Artwork may include, but is not limited to, paint on canvas, graphic illustrations, watercolor, charcoal, ink or pencil. Photography and three-dimensional art will not be accepted. The artist’s signature should not show on the artwork, nor should the text for the wine type, although the final label will acknowledge the artist as the winner of the competition. Artwork must be submitted by March 11, 2019, in digital form to missionpointlight.friends@gmail.com. There is also a non-refundable application fee of $25. After a juried assessment, the final three to five pieces will be displayed at a wine and cheese open house reception at Bowers Harbor Vineyards on April 12, 2019. The winner will be chosen that day by popular public vote, via cash donation. All proceeds from the contest and awards reception will go to support the work of the Mission Point Lighthouse Friends. Download the Submission Application here, and download the Official Competition Rules here.